During its radio heyday, "Amos ‘n’ Andy" was - to use a popular modern-day expression - the “watercooler” show of its era. Though the Crossley poll (the rating system of the time) reported that the show had a rating of 53.4 during the 1930-31 season, such a system wasn’t necessarily a wholly reliable instrument to truly measure "Amos ‘n’ Andy’s" audience; better indicators are the facts that there was precious little telephone activity or “bathroom breaks” while the program was on the air and, in addition, many movie theaters back then made arrangements to interrupt their screenings and “pipe in” in the broadcast mid-film for fear of losing paying customers. Newspapers frequently published daily accounts of the events that took place on the serialized show. An oft-told anecdote relates that, at the peak of the show’s popularity, it was possible to take a walk around any neighborhood block on a warm spring evening and not miss a moment of the broadcast, since the windows of most homes were open and practically every radio was turned to the program. So, in February 1943, the show’s creators and stars — Freeman Gosden and Charles Correll — took a brief sabbatical to revamp the series from its original serialized quarter-hour format to a slickly-produced, half-hour situation comedy. 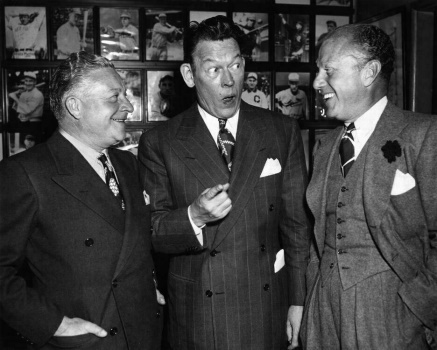 The two men lined up a new sponsor, Lever Brothers, who made certain that once the new "Amos ‘n’ Andy" inaugurated their first half-hour broadcast on October 8, 1943 (back to their old National Broadcasting Company stomping grounds), boxes of Rinso and cakes of Lifebuoy were given out free to members of the studio audience. The writing on the show, which in the early days had been the sole bailiwick of Gosden and Correll, received a boost from a team of comedy writers - notably the young team of scribes Bob Mosher and Joe Connelly, who would later supervise the television version of the series in the 1950s. The Kingfish was one of the program’s best-known and popular supporting characters, making his appearance in the early days of the show. But the half-hour format proved to be his meat; audiences loved his weekly attempts to swindle Andy out of some fortune or treasure which the thick-witted Andrew H. Brown had managed to acquire, and it wasn’t too long before the focus of the comedy zeroed in on a weekly formula highlighting the Kingfish’s machinations. Gerald Nachman, author of "Raised on Radio," once observed that the Kingfish’s success at edging straight man Amos out of the proceedings was his “ultimate con job”; more than a few listeners in the show’s later seasons no doubt wondered why the show wasn’t retitled "The Kingfish ‘n’ Andy." But before the Kingfish completely came to dominate the program, Gosden, Correll, and their writers managed to craft some truly memorable episodes. A Thanksgiving broadcast from November 19, 1943 skillfully blends comedy and pathos in a tale that finds Andy desperate to locate a turkey for his nephew and his Army buddies for Thanksgiving dinner. One of "Amos ‘n’ Andy’s" finest moments occurred on a January 28, 1944 in the form of a parable that finds Andy the recipient of a $1,000 bill. (Both of these programs are available in Radio Archives' earlier collection, "Amos ‘n’ Andy - Volume 1" .) This new set features classics like “Get Acquainted”, in which an innocent misunderstanding regarding Andy’s intention to join a singles club nearly shakes the foundation of Kingfish and Sapphire’s marriage, and “Chauffeur”, which features a hilarious courtroom trial as Andy is accused of the theft of $2,000. Because of his concerns about the quality of the new version (and also in maintaining the quality of his performances) Charles Correll had most of the programs of the new series recorded on 16" transcription discs for his personal library. In the 1970s, Correll had the programs professionally transferred from discs to top quality 1/2" tape -- but explicitly requested that the commercials for Rinso, by then the show’s sponsor, be edited out at the same time. Thus, though the programs in this collection may be commercial-free, they're all taken right from Charlie Correll’s own transcription collection. The audio fidelity of these shows is astounding - in fact, they sound far better than when they were first heard over NBC in 1944 - and have been painstakingly restored for your enjoyment.